Stephen Harper was grilled over his position on coalitions on Day 2 of the federal campaign. Stephen Harper continued to accuse the other party leaders Sunday of planning a "reckless" coalition, but it was the Conservative leader's participation in 2004 talks with the NDP and Bloc Québécois that dominated questions on the second day of the campaign. Harper got the first full day of the campaign underway in Brampton, Ont., just outside Toronto, where he said "the Liberal-NDP-Bloc Québécois coalition" would move with "lightning speed" to seize power if he is elected with another minority government. Liberal Leader Michael Ignatieff flatly rejected the idea of a coalition on Sunday, and said Harper has some explaining to do. "The person who's got a problem with a coalition is Stephen Harper. He's got to explain what he was doing in Toronto hotel rooms with Jack and Gilles," Ignatieff said, referring to NDP Leader Jack Layton and Bloc Québécois Leader Gilles Duceppe. "We will work with other parties but a coalition is out of the question." Sunday afternoon in Burnaby, B.C., Harper continued to focus on the suggestion the other parties would quickly move to form a coalition if he wins another minority rather than a majority. Harper looked relaxed and comfortable as he moved around the floor, speaking without notes and without a podium or a microphone to hang onto. "A sea of trouble is lapping at our shores. Disaster in the Pacific, chaos in the Middle East, debt problems in Europe, and of course the very serious challenges south of the border. Canada is the closest thing ... that this world has to an island of security and stability." Harper's own 2004 talks with Duceppe and Layton dogged him earlier in the day. On Saturday Duceppe raised a letter written out of the 2004 meetings, and on Sunday the coalition issue was put directly to Harper during a campaign stop in the Toronto area. He was asked to explain whether he is being hypocritical in his condemnation of coalition governments. 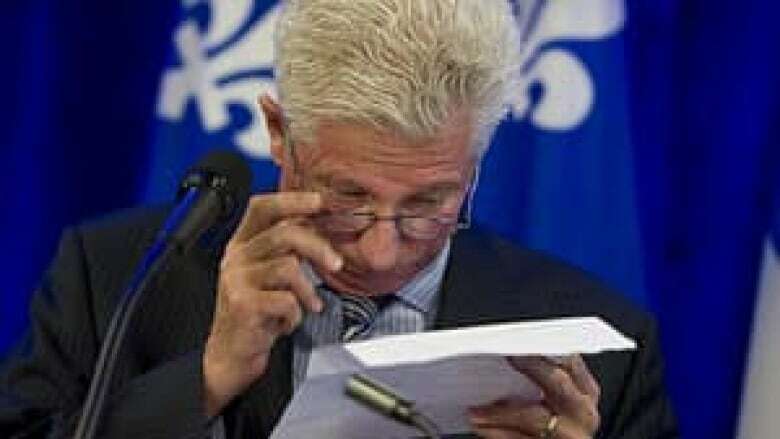 Bloc Quebecois Leader Gilles Duceppe uses reading glasses to read signatures on a letter written in 2004 and signed by then-Opposition Leader Stephen Harper, NDP Leader Jack Layton and himself suggesting the Governor General consider 'options' if Paul Martin's minority government fell. (Paul Chiasson/Canadian Press)Harper has said that getting elected is the only legitimate way to form a government, but in 2004 Harper seemed prepared to govern, according to the letter addressed to the Governor General that said "all options" should be considered before calling an election if Paul Martin's minority government were to fall. "I wasn't trying to bring the Martin government down. 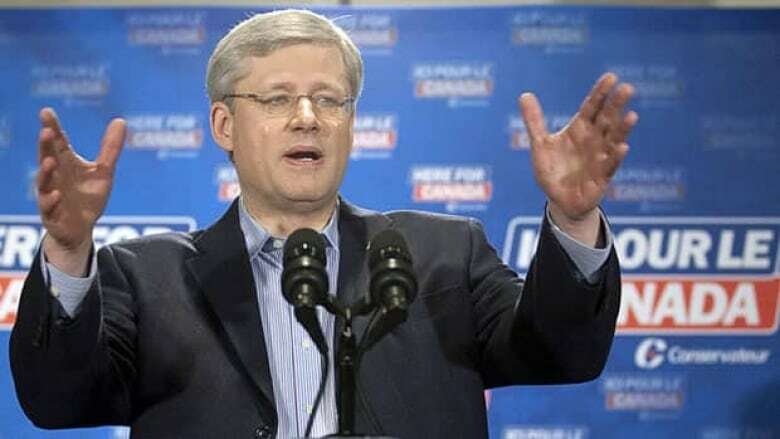 I wasn't even tabling a confidence motion," Harper said Sunday. It wasn't until 2005 that a non-confidence motion was moved and that was with the purpose of forcing an election so the Conservatives could get a mandate, he said. Harper said he is committed to only forming a government when his party wins. "That's the commitment we will live by and we expect other parties to make the same commitment," he said. "The Conservative party has only formed government when it has won elections. Period." Harper said Sunday he thinks it is "wrong" for opposition parties to think they can form a government without being elected. But Layton and Duceppe disagree with Harper's assessment of what happened in 2004 and say he's now contradicting the views he held then. They said a coalition government was one of those "options" referred to in the letter to the Governor General and that Harper would have led it. "What Mr.Harper was intending to do, it is absolutely crystal clear to me, was to attempt to become prime minister even though he had not received the most seats in the House. And that letter was designed to illustrate that such an option is legitimate in Canadian constitutional traditions," Layton said at a campaign event in Surrey B.C. "And there was no question about it, I was in the meetings where this was discussed." Layton said he signed the letter with the intention of pressuring Martin to work with the other parties, but that Harper had another goal in mind. "It became increasingly clear to me after the letter was sent and as the discussions proceeded, that Mr. Harper was actually proposing that he become the prime minister even though he hadn't received the most seats. This is rather different than the condemnations he's laying out today," said Layton, who has left the door open to the idea of a coalition. He says he's willing to work with other parties on a case-by-case basis or in more formal arrangements. Duceppe, for the second day in a row, had a copy of the 2004 letter at a campaign event and also challenged Harper on his assertion that second-place finishers can't form government. "Stephen Harper didn't hesitate in the past to deal with dangerous socialists and separatists," he said, referring to how he says the Conservatives view the NDP and the Bloc. The Conservative campaign team issued a press release Sunday that said there was no coalition in 2004 and included quotes from a press conference that Harper, Layton and Duceppe held together where Harper described their joint letter to the Governor General as "a co-operative effort." Campaigning in Montreal, Ignatieff rejected the idea of a coalition that Harper says Ignatieff will form if given the chance, and said the Conservative leader keeps pushing it to try to distract voters. "Mr. Harper wants to wave the coalition around so he doesn't have to explain a whole bunch of bad choices and so he hopes that Canadians won't pay attention to the great stuff, the fabulous stuff, we've got to offer to Canadian voters," he said. The leaders were fanned out across the country Sunday with Layton starting the day in B.C., Ignatieff and Duceppe in Quebec, and Harper in a Toronto-area riding. The Conservative leader leader repeatedly used the coalition phrase in his speech at a convention centre and blamed the opposition parties for prompting the May 2 election. "We should all be back in Ottawa at our desks, working on the economy," Harper said. He highlighted a number of measures from the federal budget with the refrain that "the coalition said no" to the measures, while "Conservatives say yes." Do you expect the campaign to affect your choice of party? Harper didn't use the word "majority" in his remarks Sunday morning, as he did a day earlier, but repeatedly said the country needs a "strong, national, Conservative government." Picking up seats in the GTA is key to Harper getting a majority, which he acknowledged Sunday. "We want to win everywhere. Obviously winning more seats in the GTA is part of that, as is winning more seats in every region of the country where we don't have seats already," he said. The Liberals are countering the Tory message by painting themselves as the party that represents everyday Canadians. 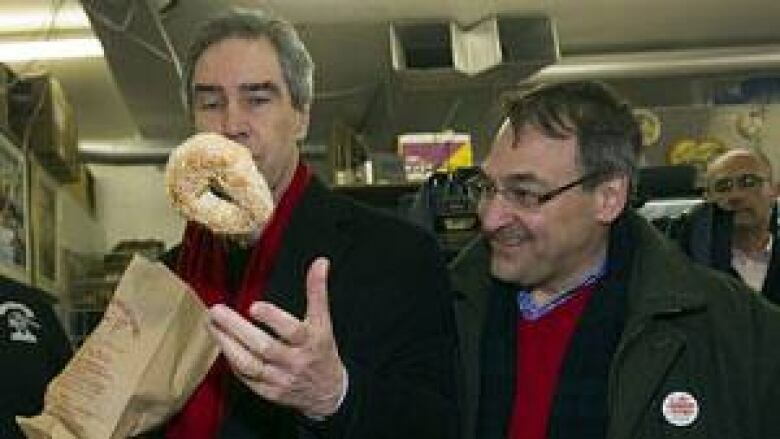 Liberal Party leader Michael Ignatieff buys some bagels while mainstreeting March 27, 2011 in Montreal. Federal Liberal candidate Martin Cauchon is at right. (Ryan Remiorz/Canadian Press)Ignatieff told supporters at a restaurant in Montreal that only Liberals can take down the Conservatives — as a province-specific party, the Bloc doesn't have the reach. "I want to replace Mr. Harper," he said in French. "We're the only political party that can replace the Harper government." Ignatieff says he's running in the election because he loves democracy. "(Quebeckers) have the power to choose a government of the people. A government who listens to people, a government who serves people. A democratic government," he said. Ignatieff began his Day Two of the campaign in Montreal's Outremont and Papineau ridings Sunday morning. The NDP's Thomas Mulcair currently holds Outremont, with Liberal MP Justin Trudeau representing Papineau. Trudeau is one of 14 Liberal MPs in the province; the Bloc holds 47 seats. The NDP say they're the real alternative to the Conservatives because in many ridings their candidates run second to the Tories who won the seats. Layton was visiting Surrey, a city just outside Vancouver, with a rally at the Sheraton Guilford Hotel followed by meeting local business owners. At the rally he focused on the HST, the province's much-hated tax that played a role in former premier Gordon Campbell stepping down earlier this year. Layton says Harper ordered his MPs to vote for the HST. Federal legislation was needed to enable B.C. and Ontario to harmonize their provincial sales taxes with the federal GST. "Even though he knew full well that British Columbians were saying no, every Conservative MP voted yes to the HST. I think it's time to hold Mr. Harper and all those B.C. Conservative MPs to account for what they did," Layton said. Layton said Harper promised to fix Ottawa, but five years after he was first elected prime minister, nothing has changed. "(Harper) said he would end those Liberal-style scandals, and he simply replaced them with scandals of his own, didn't he?" Layton said. The Surrey-North riding Layton spoke in has changed hands regularly in recent years. It used to be held by New Democrat Penny Priddy, but Conservative Dona Cadman won it in 2008. Before Priddy held the riding, Cadman's late husband Chuck held the seat for the Reform Party. The NDP's Jasbir Sandhu hopes to take it again. With five sitting MPs, the NDP has support around the Vancouver area, although Burnaby-Douglas MP Bill Siksay is retiring from politics. The party has Kennedy Stuart, a Simon Fraser University professor, running to replace him.